Well, i have been working on some hand-drawn figures for the last year or so, and I wasn't able to get them finished... until now. I took a couple and re-worked them with some small changes or colors. There are a couple that are 100% new. Here is a familiar little guy from ERA OF WAR, and now 100% fantasy for Deadly Missions. I am drudging through sketches and artwork deciding which ones are going to make this cut. The good thing is, if they don't show up here, they may be showing up elsewhere. I am working on getting this new set out. I have a half-dozen (or so) creatures and heroes to wrap up. There are going to be about 21 top-down creatures (as usual) and 8 heroes (each with a corresponding character card). I am also working on a set of map tiles, that can be used with other tiles by our previously released sets (featuring tiles from Inked Adventures, Old School Dungeons, and Nemo Works). Here is another sneak peek: LEON THE GREAT. The new figures are terrific! Well, I have been sitting on these for a while now. I am going to finish three more, but the ones I am choosing are quite good, so I am thinking I need to raise the bar on the last few. I also took my centaur and re-modded her into an Elven Ranger. I think this is the fourth incarnation of her, but the simplicity of the figure really seems to work for her. This set seems to have the most ranged attackers to date. * Most seem to have a ranged combat attack, or a magical attack. *- Fantasy sets. The Sci-Fi sets had more, because most of them have pistols or laser guns. Here is another figure from the set. I created her a while ago, and am happy to see her finished. Glenn Williams suggested her as a Runemancer, and Parduz healed her of her polio (a slight misalignment). I think she looks great, Kila. But . . . The black line around the glow on her hand is kind of out of place. I mean it is light, so it should have an "object line" around it. I would even remove the black border for that part of the model. Just some thoughts. I will add the buckler details later. It's so great to see how much you've progressed as an artist since you started WAY back in the day! I LOVE your hand drawn stuff (always have) and look forward to printing and making these and MANY more from you! I meant, of course, in reference to your Runemancer, that light shouldn't have an object line around it. But you seem to have grasped my meaning despite my worst possible typo. I understand what you meant, CBL. I had a plan about that, but I reverted back to the "old-school Mage Orbs" (like in the WARMANCERS set). I will consider that in future figures. As far as being "better," I don't know about that. I have learned that I can't compare my stuff to other people like okumarts, darkmook, and everyone else here that has more talent than I do... I have learned to compare my stuff against my other stuff. If it looks better, then it means I am improving. I obviously like my figures, or else I wouldn't post them. I am really excited to be drawing again. Sure, it takes a lot longer to do these than the CG stuff, but I like the way they look on the table more. 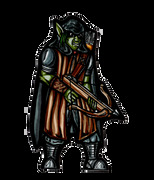 Here is the last of the previews, the Goblin Archer. Loving the little goblin crossbowman Kila! Kiladecus tell me, what techniques you use to create your figurine? pavaro - My techniques are much like the people here (only without all of their talent). Step One: Come up with an idea. Sometimes it is just a matter of dragging a pencil across the page, and watching the image take shape. Step Two: Draw the details and "ink" it. Step Three: Have Parduz tell me the legs are too short, and the spine is misaligned. Step Four: "Fix" the issues Parduz pointed out (and repeat steps three and four until he can't see any more issues). Step Five: Use my Sharpie (permanent markers) to color the fronts and backs. I do use GIMP to clean up some details, and make the borders truly "black." After I color them, I re-scan them and tweak the colors again with Gimp. The Renders are a lot "easier" in some regards, and "harder" in others. I am not as talented as Devin Night (he has done a lot of top-downs for Deadly Missions), so I am sticking to the rendered top-downs. 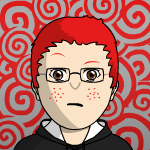 migibb - This is a little bit of a "grey" area. If you are looking for front and back hand-drawn images, I *think* that the only set that has this is the set I did with Reivaj Minis... which I believe is "Tomb of the Spider God." As I recall, the figures were bundled, so you would buy the figures in the bundle (or separately) and you would use the stat cards for them. The other non-rendered artwork is the set I did with Torn World RPG (fantastic artwork, but the art is double-fronted - the same image on the front and back), which is the Fantasy Dungeon Core game. There is also the Dark Skull Studios collaboration which ALSO features art by some VERY talented individuals, but no "backs." These are the same as the fronts, only greyed out (greyscale) to represent the "back." The majority is CG renders, and ALL of the Sci-Fi/Horror/Modern is. This is a bit of a test to see how well the hand-drawn stuff is received. So far, I feel like the Prodigal Son returning home, but we shall see. Hand-drawn stuff takes forever to get it to look right. Renders can generally be cranked out in an hour or two (depending on the complexity of it). To answer other questions, "YES, I will continue to do renders and will do hand-drawn stuff, as well." I try to release the best figures I can, using various mediums. I feel there is plenty of room for both styles. I'm laughting alone in my room now! I've been promoted from "programmer" to "iterator"
No, you are the "Master." There will be a tile set for this expansion. It is a set of hand-drawn maps, all drawn by me. I hope to wrap this up in the next week, or so. Well, we are getting there, slowly, but slowly! Here is what the cover will look like. I like to add fun little shots in the inside of the booklet, and following Sirrob01's example, I was able to come up with this little pic. It showcases the fronts of the eight heroes, and give you an example of scale. TARYN (the female with the mage orb) is the only (full) human, so she may look small, but that just means that the others are just that big. It is a long lost civilization that has recently been discovered by the king of Somaria's soldiers. He has contracted the heroes to go underground and explore the city. It is rumored to have more gold than anything that has ever been found to date. There are catwalks and walkways that rest on an underground sea. Good thing it is abandoned, or else you might have to encounter sea creatures and amphibious monsters that swim and walk like men. Let's go find the gold! Who's with me? !